Having a stable, fast internet connection might be one of the most demanded luxuries of the 21st century. While being able to access the internet is certainly not a necessity for survival in modern life, the way people react when they lose out on this luxury makes you think it is a necessity. Many customers that use Wifi technology in order to access the internet are often clueless when it comes to setting up and tinkering with their wireless system. This is only partially the customer’s fault, as a wireless system can often be confusing and overwhelming to manage. Consequently, many companies have innovated routers in recent years that are designed with simplicity and ease of use in mind. Google Wifi and Orbi are two such products that have been recently released. Orbi is manufactured by the company Netgear. In this article, we discuss the pros and cons of Google Wifi vs Orbi. Specifically, we first give an overview of both technologies before isolating certain characteristics and analyzing them in further depth. Eliminates WiFi dead zones and buffering - 5,000 square feet of consistent coverage - with speeds up to 30 Gbps. The most award-winning Mesh WiFi system on the planet: PC Mag, CNET, Wirecutter, Forbes, SmallNetBuilder. Orbi can be purchased on Amazon, though the price varies depending on what model customers buy. One popular model is the 2-pack, also known as the RBK50. This product comes with a satellite and a router, which is the minimum that most of the models come with. The 2-pack costs $$. Orbi utilizes tri-band technology when connecting multiple devices to the wireless network, allowing for stable speeds regardless of how many devices are being used. Netgear advertises that Orbi can cover 5000 square feet of area without losing connectivity or producing dead zones. Orbi is also expandable, allowing users to purchase more satellites to extend the range of their internet coverage. Orbi features 4 ethernet ports per satellite and 3 ethernet ports per router. Additionally, Orbi can deliver Wifi speeds up to 223 Mbps. Orbi also flaunts an all-white color and weighs a little less than 4 pounds, with the router being 7 inches wide and 9 inches in height. ​Google Wifi can be purchased on Amazon as well, and the 1-pack model starts at $. 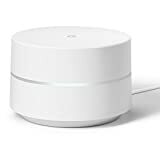 Google Wifi uses dual-band technology when allowing multiple devices to connect to the wireless network, which causes speeds to decline when new devices are added. Furthermore, using one Google Wifi Point, which is the name of each router, allows users to cover an area of 1500 square feet. Using 3 Google Wifi points, on the other hand, allows users to cover an area of 4500 square feet. The 3 pack system can be purchased for $ on Amazon. Google has advertised that Google Wifi has a data transfer rate up to 150 Mbps. Each Google Wifi Point has 2 ethernet ports, weighs less than a pound, is 4 inches wide and about 2 inches in height. Additionally, each Google Wifi Point features an all-white design. When considering the Google Wifi vs Orbi, the price of each product is perhaps the most significant factor. Orbi's most popular package, which costs $$, includes a satellite and a router and covers 5000 square feet. In order to cover about this same distance, you would need to purchase the 3-pack of the Google Wifi, which includes 3 Google Wifi points and costs $. In this sense, Google Wifi is a more affordable product. What’s also unique about Google Wifi is that customers can purchase an ultra-affordable 1-pack for $. Orbi does not offer this possibility, as their cheapest model costs $ and can be purchased at Best Buy. This model covers 3500 square feet. If you already have Google Wifi or Orbi and you just want to extend your existing coverage, Google Wifi is still more affordable. Orbi allows customers to purchase an indoor expansion pack for $ which offers an additional 2500 square feet of coverage. However, if you had the Google Wifi, you could expand your current coverage by 3000 and pay about that same price. In this sense, Google Wifi is also a more affordable system once you already have it and want to expand your coverage. This is an important point considering how unreliable many of the estimates are concerning the square foot of coverage. While these estimates are a good guide, ultimately every foot matters when considering coverage in a house. If the estimates are off by several feet, then that could mean inferior coverage in some room of the house, which could be devastating. In this sense, many users with larger homes start off by getting several units and dispersing them across their home. Over time, however, these users will often find that an additional unit is needed to order to maximize coverage, thus forcing them to purchase more. Essentially, what this means is that if you are unsure how many square feet of coverage you’ll need, you might be better off purchasing the Google Wifi, as this will be more affordable in the long term. When researching these wireless systems, many customers forget that set up is required. Thus, customers can either pay over $100 for an expert to set the system up, or they can do it themselves. We recommend that all customers do this themselves, as these wireless systems are very easy to set up and are geared towards the most technologically ignorant users. When considering the set-up of the Google Wifi vs Orbi, it’s evident that the Google Wifi is more user friendly, though both systems represent innovations within the industry. Ultimately, users are able to sync the router to their internet using an application that can be downloaded on their phone. This application is extremely easy to use and walks users step-by-step through the basic set-up process. Wireless systems used to practically necessitate an expert installation. Now, they can be executed through the help of a smart phone app. We think Google’s application is more seamless to use and user friendly, and this is likely due to their considerable experience in the software industry. Many customers attest to this, claiming that Google Wifi is the easiest wireless system they’ve ever set up and that this is partially due to the easy application that complements it. Ultimately, if you are stressed out about having to set up your wireless system, then either product should assuage you. Gone are the days when setting up your home system took hours. With either Google Wifi or Orbi, you can be assured that your wireless system will be up and running within 15 minutes. When considering Google Wifi vs Orbi, the number of units you’ll need in order to maximize your coverage is an important factor. In this regard, Orbi is much more efficient than Google Wifi, requiring that users have less devices in order to cover a given area. In particular, in order to cover 5000 square feet, Google Wifi requires at least 3 devices whereas Orbi requires merely 2 devices. Furthermore, if you wanted to expand the area you are covering, Orbi provides an additional 2500 square feet of coverage for each additional satellite. Each additional Google Wifi Point offers 1500 feet of coverage. If you’re covering a large area with your wireless system and want to minimize your units, then the Orbi is the ideal system for you. Alternatively, if you have a small space, then the Google Wifi might be best for you, as you only have to use one unit. However, another factor when considering Google Wifi vs Orbi is that Orbi is significantly larger than Google Wifi. Thus, purchasing Orbi might result in less devices throughout your house, but each device will take up more room, which could influence the aesthetics of the room. This would only be a problem if you disliked the sleek white design of Orbi. If this is the case, then going with the Google Wifi might be the best option, as these devices are less noticeable even if they are similarly white. Each Orbi router has 3 ethernet ports while each satellite has 4 ethernet ports. This makes Orbi incredibly dynamic when it comes to dovetailing with your home entertainment system. Most home entertainment systems benefit from being hooked directly to a router, making them more efficient and powerful. By offering so many ports per unit, Orbi has made it easy to integrate your wireless system with a television, a gaming system, a sound system, or any other technology that uses the internet. When considering Google Wifi vs Orbi, these ethernet ports are an important factor since Google Wifi only offers 2 ports per unit. These means that if you have many different devices and systems that you want to hook up to a Google Wifi Point, you would likely have to buy some kind of adapter, and these are often very expensive. We briefly mentioned the dimensions of Google Wifi vs Orbi above, but it’s worth noting again that both look very similar, specifically featuring an all-white, simple design. Google Wifi is significantly smaller than the Orbi. Google Wifi is almost 20% of Orbi’s height and about 50% of its width. Many customers love the more unassuming appearance of Google Wifi, though this is really a relative judgment. Ultimately, both models are very unassuming and elegant, designed to blend in with white walls and the light of day. It’s just that Google Wifi is so small and compact that it takes this blending to a new level. Alternatively, some customers have embraced these routers as parts of their home worthy of admiration and observation. Both Google Wifi and Orbi dovetail seamlessly with home devices controlled by artificial intelligence (AI). Google Wifi works with Google Home, for example, while Orbi pairs perfectly with Amazon Echo. These multifunctional stations are becoming increasingly popular in modern households, so much so that they are challenging the recent trend to obscure the technology that dominates our lives. Instead, users are flaunting these pieces of technology as critical elements of their homes, almost like a futuristic art piece. In another sense, the companies that manufacture these products are marketing them almost like pets, which is why the AI that controls them is often given a name, like Siri or Alexa. This is an indication that we consider our technology to be akin to animated organisms in our environment, and companies are surely capitalizing on this perspective. In this sense, many customers actually prefer the larger dimensions of Orbi, as this allows them to really display the technology. A smaller router, some might argue, would be awkward. Alternatively, many prefer the smaller size of Google Wifi not because it takes up less space but because it better supports the interior design of the homeowner. Basically, we think that these routers are so elegantly designed that wanting to minimize their appearance is no longer popular. Instead, they’ve become like pieces of art that enhance and support the aesthetic of a room. 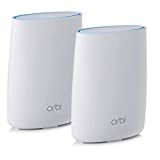 Orbi is generally considered to be a router capable of providing a faster, stronger wireless connection. Ultimately, these speeds are difficult to measure, as a one-time experiment is not necessarily a good predictor for the future. The speeds of your wireless connection depend on many different factors that can’t be mimicked in a single experiment. With that being said, Orbi has advertised on its product webpage that it can deliver speeds of up to 223 Mbps, while most competitors offer speeds of 71 Mbps. This estimate for competitor speeds is quite low and should be taken with a grain of salt. However, while the estimate for Orbi’s speed is still an overestimate that customers are unlikely to experience consistently, it’s still an indication that Orbi is a powerhouse router. Few other routers offer a comparable level of speed, which is why other routers are often cheaper. When considering the Google Wifi vs Orbi with regards to speed, it’s important to keep in mind how close you’ll be to your router when you’re using it. If you plan on using your laptop mainly near your router, then the difference in speeds between Google Wifi and Orbi might be less significant. The main exception to this is if you are doing a lot of gaming or using applications that require lots of memory, power, uploading and downloading. In these cases, you might be better off just erring on the side of caution and purchasing Orbi. Even though it’s more expensive, the mere possibility that it could result in a smoother, more efficient internet experience might warrant its purchase. It’s also worth noting that Orbi offers some interesting purchasing options for customers that want to enhance their current system. In particular, customers that have an Orbi router can expand their coverage by 2500 feet using either the indoor expansion or outdoor expansion. This outdoor expansion is really the gem of the deal, as these satellites are weather resistant and are designed to facilitate wireless connectivity in outdoor conditions. Customers that use the Google Wifi do not have this outdoor option, which means they will have to rely on purchasing another Google Wifi Point to fill their outdoor expansion needs. Yet, the Google Wifi Point was not designed to work outdoors, and users might experience interruptions and disconnections if it’s improperly used in this way. In reflecting on Google Wifi vs Orbi, we really like the competitive spirit. We think the internet is perhaps the most important resource that humans have access to, and this access is facilitated by a router. It’s time we start giving routers the respect they deserve, using them as art pieces in our home and not being scared to connect them to other technologies in our homes. We think Google Wifi is the simplest, most affordable router when considering Google Wifi vs Orbi. This makes it ideal for users with smaller homes who need less area covered. We think Orbi is ideal for larger homes because we think less units are better despite the aesthetic elegance of each unit. Additionally, Orbi is generally considered to deliver faster internet speeds, which is perfect for gamers, streamers, or general browsers. Regardless, you’ll be satisfied if you go with either of these systems.